When America’s Got Talent debuted 10 years ago, a British journalist named Piers Morgan joined Brandy and David Hasselhoff on the inaugural judges’ panel. Throughout the six seasons that he was on the panel, Piers was the judge that almost every act dreaded as he became infamous for hitting his buzzer early if he did not like where the act was going! Despite his harsh criticisms, Mr. Morgan played an instrumental role in the discovery of fan-favorite acts including Terry Fator, Nuttin’ But Stringz, Barbara Padilla, Recycled Percussion, the Texas Tenors, Jackie Evancho, Fighting Gravity, iLuminate and Lindsey Stirling. Tonight, Mel B. invited the former head judge to return to give his opinion on the remaining acts. He also had one opportunity to change one act’s life forever. By pressing the Golden Buzzer, Piers’ act will be automatically be heading to the Radio City Music Hall Live Shows! Which act was the lucky recipient of the last Golden Buzzer? Did Howie pull any antics on his former sparring partner? Read on to find out! 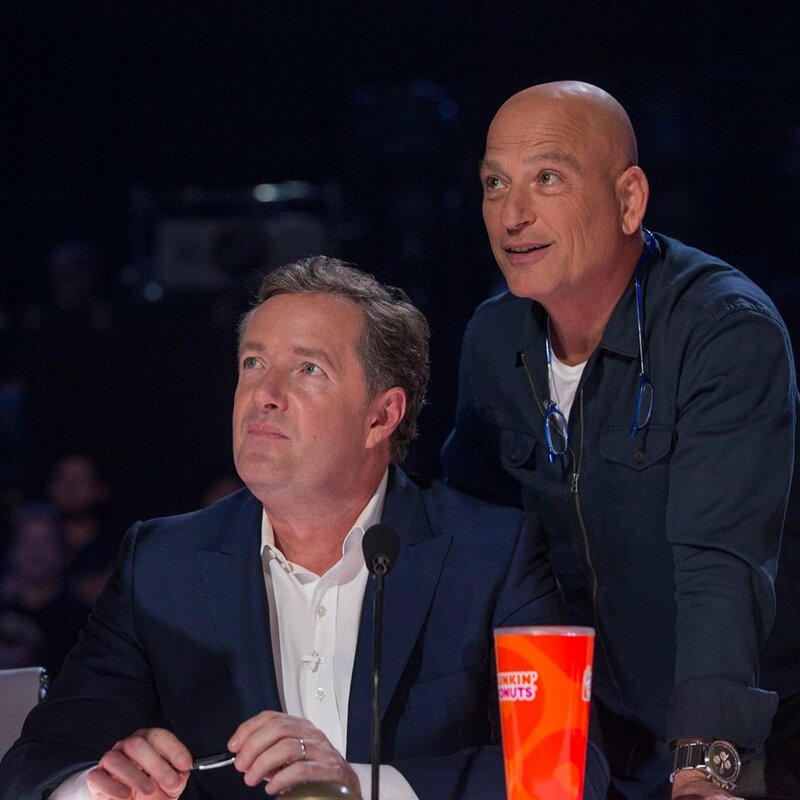 Howie’s mouth dropped when he first saw Piers Morgan walk into the Judges’ Room and he immediately started to plan one of his pranks. As the judges walked into the arena, Howie ordered the elevator to stop halfway where it ruined Piers’ grand entrance. As Nick explained the Golden Buzzer to Piers, it was time for brothers Zac and Cameron (The Gentlemen) to face the judges. Wearing white tuxes, the Fairfield duo showcased smooth moves that would impress Twitch, Ivan Koumaev, Teddy Forance and Misha Gabriel. Howard advised them to not be repetitive with their choreography and Piers bluntly added that the stage swallowed them. Mel B disagreed with the head judges and impressed with their movements, Howie also called them: “the full package.” Host Nick Cannon called out both Piers and Howard when the Gentlemen left the stage for being too harsh in their critiques. Throughout the night, Piers proved that he is still known as the King of Mean as he constantly gave out buzzes left and right. Hoping not to get on Piers’ bad side was 43-year-old magician Derek Hughes. He hoped to use telepathy to his advantage, but as the act continued…it seemed that Derek struck out. Luckily, he was able to prove all four guesses right! Piers stated that he was not impressed with his act, but Howie liked his delivery and Howard added that he enjoyed seeing his energy. As Piers and Howard dueled over the head judge position, it was the duel of the circus acts. In one corner: Duo Vladimir! They were up against Duo Volta. If there was a nomination for the most intense act of the night, it probably would go to Duo Vladimir. The Ukrainian hand balancers might give both the KriStef Brothers and AcroArmy a run for their money with their penetrating routine. Vladimir (dark-hair) sat on the ground while blond Vladimir was in the air. Once he stood up, they regrouped and brought out two umbrella-like knifes that they promptly put in their mouths. Jaws dropped as they brilliantly executed their routine and they promptly received a standing ovation from Heidi and Howie! Heidi stated that she “absolutely loved their act,” while Piers added that they could command an audience. After seeing Duo Vladimir’s superb performance, the former lovers knew that they had to step up their performance. Duo Volta’s superb trapeze tricks were okay, but I thought that Duo Vladimir had a better presentation. 24-year-old singer Alicia Michilli hoped that she did not receive four Xs during her performance. Wearing a lovely red dress, Alicia belted a powerful and moving “Who’s Loving You?” This marked the first time I got chills during the Judges’ Cuts. Alicia’s vocal range was superb and I hope that both LA Reid and Clive Davis were watching this star-making performance. Piers stated that she had raw talent and captivated the audience, but Howard thought that they might lose her because she did not show as much emotion in her first audition. As Howie’s latest antic made everyone laugh but Piers (whose chair was removed from the stage), the dance acts tried to deliver a winning performance. Hoping to get into the Live Shows were both salsa trio Semeneya and solo dancer Aaron Smyth. Semeneya delivered a killer salsa routine, while Aaron Smyth delivered a dramatic contemporary piece that would be a brilliant audition piece for Shaping Sound Dance Company! Piers loved that he gave everything that he got, but Howie thought that it was not better than his audition. One of my favorite dance crews that appeared this season was Japanese dance crew Siro-A. They brilliantly combined video, graphics and dance together in a superb routine that made them worthy heirs to Kenichi Ebina’s crown. Just like I did with Alicia, I got chills watching this outstanding performance and the sextet got a standing ovation from Howie. Piers LOVED their act so much and gave them the final Golden Buzzer of Season 10! I agree with Piers that Siro-A would be worthy contenders of winning the season and loved the comparison between the Japanese dance act and Season Two winner Terry Fator. With the Golden Buzzer gone, the remaining acts had to step up their game! Stand-up comedian Gary Vider made me smile with his material and he reminded me so much of Taylor Williamson’s character. Howard stated that Gary was very strong with his persona and Piers was impressed with the ad-libs. While Howie was worried about his subtle comedy, Mel B admitted that despite not being her cup of tea…the audience adores him! While NYC singer Kayvon Zand looked like the long-lost love child of Liberace, the rest of the judges were not happy with his cover of Dead or Alive’s “You Spin Me Round (Like A Record).” Mel B talked about his vocal technique and Kayvon was furious with response. Piers even admitted that his behavior was insulting and he should have never picked a fight with the judges. Because of the four Xs, he was eliminated from the competition. I wished that they showed more of Vox’s cover of “Bring Me Home” over Kayvon’s fit. While Mel B and Heidi loved them, Howard thought that they would not be remembered at the end of the night and Piers did not get them. Hoping not to hear the same comments as Vox was musician Alex Boye. I loved his band’s cover of “Uptown Funk” and I think that he could be the dark horse of the competition. Mel B thought that Alex was under rehearsed, but Heidi called him a great entertainer and stated that she would fight for him. The final act to face the judges was Stevie “The Regurgitator” Starr. This is not the first time that the Regurgitator ran into Piers Morgan. He auditioned for Piers, Amanda Holden and Simon Cowell on Britain’s Got Talent five years ago. For his second audition, he used extremely sharp objects such as a sharp blade and a cherry tomato. In addition, he also used five Golden Dollars with letters on them. Piers asked him to call up the four letters that spelled “pots.” He correctly regurgitated all four of them and used a paper clip to grab the final coin. The Regurgitator received a standing ovation from Howard and Heidi. The Project Runway host wanted another Golden Buzzer and Piers called him repulsive and compelling to watch. After a difficult deliberation, the acts that are heading to the Radio City Music Hall live shows are: The Gentlemen, The Regurgitator, Duo Volta, Gary Vider, Alicia Michilli, Siro-A & Derek Hughes! Next week, the “America’s Got Talent: Season 10” Live Shows begin!